The People screen allows you to manage different types of people who may be associated with your organization. Examples of these could be members, staff, sponsors, prospective members, etc. Notes: Everyone entered on the People screen count towards the subscription member count. Clicking those tabs will show those with that person type. They are assigned by editing the person's profile. You can add new person types by clicking the red admin button. 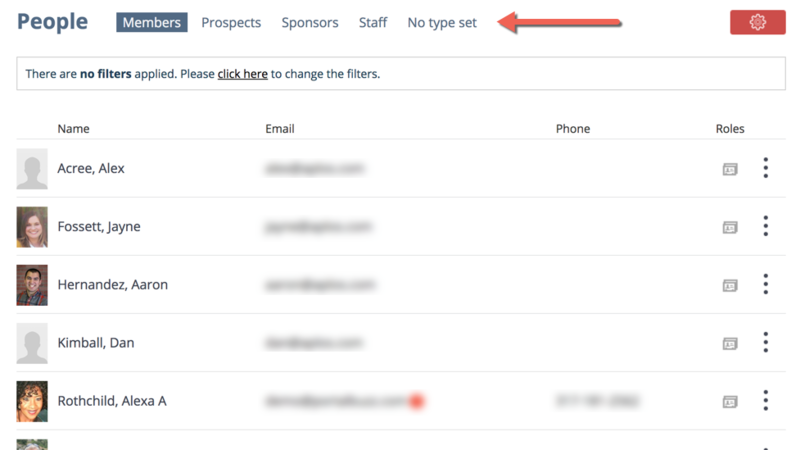 You can also inactivate, edit, and delete types by clicking the action menu adjacent to the type. Default Tab - This will be the tab that is shown when logged in people go to the People screen. Include in ALL people tab - Checking one type off will display an ALL tab that will include all checked off. These are available to anyone logged in, regardless of having the "visible to admins only" box checked. A use case is you want all members to display in one tab and not have members see the other type tabs. Email - There are auto-generated email lists for these person types. When composing an email just start typing the type name (ex. member, staff, sponsor, etc) and you will be able to select that list for the email. It is a way you can communicate specifically with that person type. Event volunteers - Everyone listed on the People screen will be available in the volunteer autocomplete boxes. So you can use this as a way to track and communicate with people who volunteer for your organization. Billing - The people types are the same as the member types in the billing area. So if you have them setup in the billing area, you will see those tabs on the People screen. If you do not want them shows then go to the person tab config as explained above and change the visibility.